The third season finale of Parenthood airs tonight on NBC at 10 p.m. Eastern. Two sequences early in the third season finale of Parenthood underscore just why the show has grown from a pleasant series to one of network TV’s best dramas in its third season, and why it required a network TV home to do so. In the first, largely free of dialogue and scored to the sort of moody indie rock the show perhaps loves a little too much, two former lovers, reunited, struggle to tell the people they’re leaving to be together again that they’re breaking up. 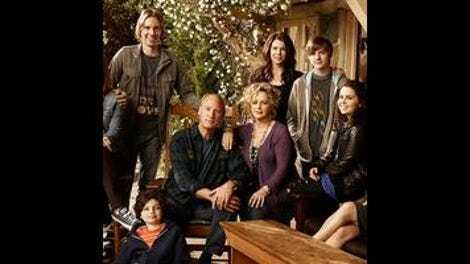 In the second, the entire Braverman family, which sits at the center of the show, gathers in the home of paterfamilias Zeek (the gruffly winning Craig T. Nelson) and mother Camille (the always underutilized Bonnie Bedelia) to learn that the two lovers—youngest son Crosby (Dax Shepard, a revelation in this part) and his former girlfriend and mother of his child Jasmine (Joy Bryant)—are reuniting. Everyone celebrates. Everyone talks too quickly and over each other. It’s the sort of chaos well known to anyone with a large enough family, and the show orchestrates it well. Parenthood is an excellent example of learning to have faith in shows that try to keep this many balls in the air. In its first season, the show took a while to get going before hitting a nice streak in later episodes, only to botch things with a too-overwrought finale. In its second season, the show seemed briefly confused about what it wanted to be, veering erratically between light domestic comedy and heavy melodrama without rhyme or reason. The show is adept at both tones, but too much of the second season seemed randomly generated, until a string of episodes during February sweeps built to a satisfying climax… only to have the show botch it yet again with the final four episodes of the season, which never came up with a coherent storyline and ended with a too-rushed, far-too-melodramatic finale. This third season, however, has been a quiet revelation. It started in a weird place, with a couple of stories that seemed like non-starters: Crosby going into business with far more level-headed older brother Adam (Peter Krause, giving a great, quietly frustrated performance), and younger sister Julia (Erika Christensen) and her husband deciding to adopt a baby from in Zoe, a pregnant coffee girl who worked in Julia’s office (the amazing—and largely unknown—Rosa Salazar, who should be the lead in a drama pilot for next year, if network executives have any sense). Both plots seemed strained, and the show had absolutely no desire to abandon either of them. As the season went on, however, it became clear why showrunner Jason Katims and his writers were sticking with these stories and others that initially seemed like non-starters: They wanted to consider just what the line is between trying to change someone and accepting them as they are. The relationship between Julia and Zoe grew complicated and messy, as the two went from a fairly typical relationship between biological mother and adoptive mother to something more like sisters, and Julia spent much of her time trying to better Zoe’s life, even though Zoe was fairly content as she was. Older sister Sarah (Lauren Graham) found herself finally in a relationship with the much younger Mark (Jason Ritter) only to realize, gradually and dishearteningly, that his youth also gave him a certain naiveté that she—a single mother of two teenagers—was long past. And Adam tussled with Crosby over just about every aspect of their new partnership, even as Adam’s wife gave birth to their third child and his older daughter wanted to go to Cornell, a dream he wasn’t sure he’d be able to let her have. There’s nothing horribly complex about any of this. These are stories that might arise out of any life at any time. But it’s the mundane nature of the show that ultimately gives it its power. The show’s biggest improvements in the third season arose from something that was always going to happen: It had been on the air long enough that the characters were developed enough for audiences to get to know them very well. Parenthood, frankly, is a show that wouldn’t work on cable. This is true for a number of reasons, but paramount among them is the fact that its sprawling ensemble cast and huge web of relationships need more time to build than a cable series would provide. The season’s best hour, “Road Trip,” which dealt with, among other things, Zeek’s anxieties about his relationship with his own mother, was almost completely stand-alone, the kind of storyline that more tightly serialized shows just wouldn’t have room for. The characters on Parenthood are all likable, sure, but there’s also something eminently hate-worthy about every single one of them. They’re exasperating and hard to deal with in the manner of your real siblings or children, and when they screw up, it’s tempting to throw up your hands and say, “Well, that was possible to see coming from a mile away.” This has been a deal-breaker for some curious about Parenthood, who would like a show that isn’t so deeply invested in portraying the ways that these people enervate and annoy each other in such thorough detail. But after three seasons of the show, that quality has also subsided. Crosby, Julia, Adam, and Sarah do stupid, stupid things and screw up mightily, but by now, we know them so well as to be ready to forgive them even before they’re making a mess of things. Thanks to the added time of the network season, characters that would be detestable with a shorter episode order become strangely warm and welcoming. Tonight’s finale isn’t perfect, unlike last week’s episode, which brought nearly every plotline to a boil. As always, it feels like Katims is trying his best to wrap up almost all of the storylines out there, in case he doesn’t get a fourth season (always possible, given the show’s ratings). But where the first two seasons’ finales introduced drama simply to pay it off, this one, centered on a wedding, pays off stories that have been slowly building over the last 18 episodes. Adam and Crosby’s partnership is put to a significant test. Julia and Zoe’s relationship reaches a crossroads. Sarah has a devastating realization about Mark. And there’s a pretty ballsy cliffhanger, at least for this show. But where other shows might play these moments up, Parenthood gives them the pitched hush of real-life drama, that sense you get when you realize everything is about to change. The show is messy, yes, with its overreliance on indie folk, its odd storytelling rhythms, and its tonal shifts; but after its third season, it’s messy in a way that seems not just forgivable, but needed. I’ll be back after the episode airs tonight with some quick thoughts on how the various storylines wrapped up, posted in this section. Here are your promised thoughts on the various moments in the finale. I suspect I'll be in a minority on this, but I really like the idea of giving Joel and Julia a son who's older than Sydney. It opens up a lot of story possibilities for a couple who are often stuck in neutral, and it allows for the show to consider the issues of class it handles so well so often. That said, it was a cheat to keep from the audience that the kid could have been older than a baby, and the show should have played fair in that regard. Man, the resolution of the Zoe storyline was great. It's the sort of thing where I think it shocked you guys less than me. I honestly didn't expect the show to have Joel and Julia come so close to an adoption, then not get to adopt the baby. That final scene with Zoe and Julia might have been the best in the episode, and it was even possible for NBC to promo it last week and make it look like Zoe was going to stick to the adoption plan. I liked that Sarah was realizing what we all were over the last few weeks: that Mark is a good guy, but he's also very, very young, with all that implies. On the other hand, I really don't know how the show makes their engagement work if Jason Ritter's pilot is picked up. But that's a worry for the show to have next season. The wedding featured a lot of what this show does at its best. It was nice and relaxed, and it allowed for some very fun little moments throughout. Plus, Billy-in-everything-but-name Riggins showed up! And hit on Sarah! Awesome. Max telling Crosby and Adam that if they wanted to fight, there was salsa in the kitchen, reminded me why he can be an amusing character. I like that the show didn't cop out and just have Crosby and Jasmine be broken up when the episode began. I also liked that you could tell Jasmine's mom was not in favor of this plan but wasn't going to tell her daughter what to do. That's it for the season! I'm expecting a season four pickup to come along in April or May. What would you like to see happen next year?